Florida coastal destinations like Destin, Florida have seen residential real estate prices plummet and a sizable portion of tourism evaporate due to overblown concerns over the oil spill. 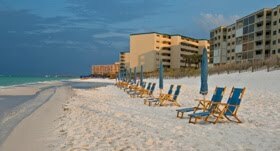 However Destin's beaches are virtually oil free and today's fire sale properties may become highly desirable when the troubled times pass. See the following post from Daily Wealth. Greetings from Destin, Florida... Ground Zero for the Double Whammy. AND the bust in tourism from the BP oil disaster in the Gulf. The thing you have to realize is, both of these issues will go away some day... People will return to vacation here. And people will buy condos here again. You also have to realize we might already be past the worst of it in both parts of the Double Whammy. Residential real estate prices are probably down 50%. And desperate local business owners might sell for even better deals than the homeowners. Driving along the main road (called 98), I've never seen so many "Going Out of Business" signs. I talked with a large-scale building contractor down here. "It's really tough now," he told me. "We had 250 people working for us three years ago. We were about one-third remodeling, one-third new homes, and one-third commercial construction. Today, it's mostly remodeling. I've cut back to 50 guys, and I have a hard time keeping them busy." He continued... "In the last few recessions, I felt like I could see a light at the end of the tunnel. The orders would start trickling in. But this recession is different. There's no light yet." My friend Jeff Archer lives around here. He has a standup paddleboard business – doing board sales and rentals. (His business is called YOLO Boards – short for You Only Live Once – see www.yoloboard.com.) I asked Jeff about how the BP oil disaster has affected his business and other local shops. "Businesses are hanging on by their fingernails," Jeff told me. "My business has been fine, mainly because paddleboarding is booming. But most businesses are really hurting." I spent an hour on the ocean, standup paddle surfing with my 9-year-old son. Not a drop of oil in sight. The ocean was clear and beautiful. Jeff is on the beaches as much as anyone. "We had some small tar balls a few weeks ago," he told me. "But they were cleaned up off the beaches really quickly. We haven't had anything lately. The water and beaches are clean." This is the most frustrating part for local business owners. The water and beaches are clean. But business is way down. "The media has scared the tourists away – but we don't have any oil." I heard that over and over. Most of the resorts here have a nice offer – essentially "if there's oil, we'll give you your deposit back and you don't have to come." But that message isn't getting out, and isn't resonating with people. You don't want to book a vacation to have it cancelled. The Double Whammy has smacked Destin. Real estate prices are possibly down by half. And business owners are "hanging on by fingernails." Meanwhile, Destin's beaches are clean. Oil free. No problem. Don't get me wrong... It's not a ghost town. It's touristy here. And crowded. If business is terrible, I'd hate to see the main road when the town is full. But if you ever wanted a vacation property or a business in this area, chances are good you'll never have the kind of opportunity you have right this second. I am 100% certain the Double Whammy will dissipate. If you're interested, and can swing it, it's probably time to buy.